The Puget Sound Mycological Society (PSMS), one of the largest of its kind in the world, hosts an annual mushroom show that surely sets a standard for all other mushroom shows to emulate. 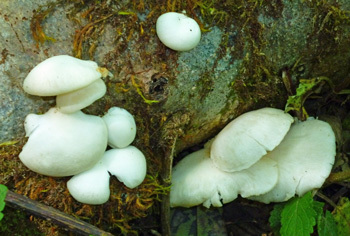 Typically, there are over 200 varieties of fungi on display along with slide shows, lectures, and a number of items for sale, such as field guides, cookbooks, t-shirts, and scientific materials for the more serious mushroomer. Of course, we have to reveal that we're a little partial to anything that PSMS does, having been active members back in the 1980s and 1990s, before moving to Oregon's beautiful south coast in the late '90s. Word has reached us that one of the most memorable moments of a recent show was the Thai Wild Mushroom Coconut Curry that was cooked up by the Mycophagy Committee. Not familiar with the word: Mycophagy? 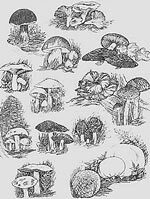 We weren't - Committee Chair Jo Ann Henderson explained that "Mycophagists are people who cook and eat mushrooms." Be sure to mark your calendar for the 2016 show which will be held in the Bellevue College Cafeteria at 3000 Landerholm Circle SE in Bellevue. Admission fees are $10 for adults, $5 for full time students with IDs, and free for children 12 and under. The show will be open on Saturday, October 29th, from noon until 7:00 pm and on Sunday, October 30th, from 10:00 am until 5:00 pm. Who knows what incredible edibles might be available for the attendees this year! In a medium saucepan heat oil and sweat onion and wild mushrooms. When most of moisture has evaporated, add red curry paste. Cook over a medium heat until onions are soft and curry is dissolved. Blend or process tomatoes until smooth and add to pan with onions and mushrooms. Add coconut milk. Bring to a boil and turn heat down to a simmer. Add sugar, lime juice, and basil. Cook, stirring occasionally until flavors are blended, about 10 minutes.